In my early teenage years I made many bicep training mistakes. Like many beginner trainees I desired big biceps and so the first weight training exercise I learned was the bicep curl. Raising the arm and flexing the biceps is and always has been synonymous with displaying your strength and muscularity – at least for the layman. When you show someone your muscles they usually do not want to see your lower legs. More often than not they want to see your guns. For trainee bodybuilders not only are softball sized biceps desired, but peaks the size of mountains like those displayed by Arnold Shwarzenegger in his pomp. 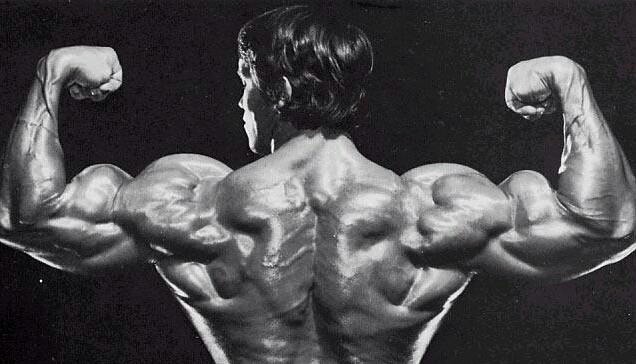 Early muscle magazines offered solutions to both these requirements – attaining massive biceps by performing barbell curls and seated incline curls, and concentration curls to build the peak. There was even a Weider principle called the peak contraction principle. Whilst barbell and incline curls will indeed build bicep mass, performing concentration curls will not build a peak, neither will they significantly effect the shape of your bicep, this is a fallacy. Anatomically, the biceps muscle itself (known as the biceps brachii), is comprised of two heads – the short head or outer biceps and the long head, or inner bicep. They are responsible for elbow flexion (raising the hand toward the shoulder), elbow supination (rotating the palm upward) and shoulder flexion/transverse flexion. Also closely associated with the biceps, although not strictly part of their anatomy, are the brachialis and brachioradialis. The brachialis is situated on the side of the arm between biceps and triceps., the brachioradialis at the top of the forearm. The training and development of both these muscles should also be prioritised as they will help increase the overall size and strength of your arms. What trainees invariably fail to realise is that you cannot build big biceps, or big arms in general without adding bodyweight. Stick thin trainees can curl to their hearts content but will not develop any appreciable muscle on their arms. They must firstly increase their overall body mass by employing basic compound multi-joint exercises, in conjunction with sufficient calorific intake in order to build an overall muscular foundation. Charles Poliquin has stated that in order to add an inch in circumference to your arms you would need to add about 5kg of lean body mass. I am unsure of the accuracy of this statement but it is probably close to the mark. You do not see big thick branches growing out of small thin tree trunks – you would do well to remember this. That being said, unfortunately there are no strict multijoint exercises for the biceps alone – however the chin up ( which primarily works back and biceps) comes closest and is extremely effective as a bicep builder, especially when weighted. Whilst large compound moves like squats, deadlifts and barbell rows are the best moves for eliciting overall physical growth, your prime movements for biceps themselves are likely to be mainly single joint exercises. As a rule of thumb when choosing which of these are most effective it is best to utilise those that allow you to handle the most weight. This is likely to be the standing barbell or dumbbell curl. Everyday in the gym trainees can be observed performing curls ad nauseum in the vain hope of developing big biceps. They spend hours doing countless sets of various curls employing the “more is better” philosophy. Whilst variety is required for long term training success the result of doing too many sets is overtraining the muscle and zero progress. Even some advanced trainers are guilty of this – some performing in excess of 30 sets for biceps alone. This is not necessary and is counterproductive. The bicep is a small muscle – one of the smallest that we train for hypertrophy. It should therefore not be trained like the back or the quadriceps. Beginners need to perform no more than 5 or 6 sets for optimum training results. Single-joint movements usually make up the bulk of bicep training. This is unsurprising as elbow flexion involves movement only at the joint. Ideally this means that when curling your arms should be fixed by your sides throughout the movement. Unfortunately many trainees turn standing curls into multi joint moves allowing the elbows to stray from the sides and using the legs and hips to assist completion. They are either using too much weight or are not conversant with proper form. This is one of the most common bicep training mistakes. This obsession with using the heaviest weight possible results in engaging muscles other than those being targeted, in order to cheat the weight up. I know as I did it myself for too long. Barbell curls end up becoming reverse grip power cleans for example. Many trainee bodybuilders start cheating on curls from rep number one, and gradually increase their use of momentum as the set progresses. Cheating is a valuable tool for pushing sets beyond strict, full-rep failure, but if you do so before that point, you will bypass many of the contractile muscle fibres and therefore not fully engage the muscle. As previously stated aside from elbow flexion another function of the bicep is supination. When performing dumbbell curls, supinate your wrists during the movement. Start with your palms facing your sides at the bottom of the movement and finish with them facing up at the top of the contraction. Standing curls can be made even more strict by placing your back against the wall. Additionally performing the exercises seated prevents assistance from the legs and hips. Exercises that fix the elbow on a bench ie preacher curls are also a viable alternative. Concentration and preacher curls, where the arm is stabilised by pressing against your inner thigh or a bench, almost completely eliminate your ability to use momentum. As far as the intensity of your workout goes, take only the final set of curls to beyond failure via cheating, forced reps, negatives or drop sets. Research indicates that the eccentric phase is the most important one for producing muscular hypertrophy. Most trainees are not cognizant of this fact. Certainly the average trainee in the gym looking for big guns will not be aware of this. At the end of the concentric portion of the lift he will basicly just let the bar fall back under its gravity. This is a big mistake and is leaving a lot of potential muscle growth on the table. 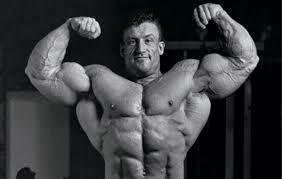 Former Mr Olympia Dorian Yates is on record as stating that ignoring the eccentric portion of a repitition is the single biggest mistake made by trainees. So in order to optimise training effect when you curl, it is best to perform the movement slowly. Take approximately two seconds to raise the weight, hold the contraction for one second, then take approximately two seconds or longer to lower the weight. Research has recently shown that taking even longer on the eccentric portion of a movement increases hypertrophy. Bicep training itself is fairly straightforward as it is a relatively small muscle. However in order to optimise upper arm development another elbow flexor – the aforementioned brachialis needs to be developed. At first sight the brachialis appears deceptively small, a round mass on the outside of the upper arm situated between the biceps and triceps. The visible portion however is only a part of the muscle the rest of which lies under the bicep. The greater the development of this muscle the greater it’s contribution to the width and thickness to your arm. The brachialis is best developed by performing elbow flexion with the hand in a neutral position. Standing or seated hammer curls are one of the best exercises for developing the brachialis. These can also be performed effectively on a preacher bench. Additionally when you curl with your palms facing each other, as when performing hammer curls, you also target the biceps’ long head and the brachioradialis. The brachioradialis sits on top your forearm near your elbow and is the largest muscle of the forearm. It is also involved in a number of elbow-flexion movements. The training and development of this muscle in addition to the biceps and brachialis will help elicit the greatest Increases in overall size and strength. Ensure that hammer curls are added to your training program. Arnold Schwarzenegger was a huge proponent of brachialis training. As far as bicep development goes performing one type of curl for months on end probably won’t cut it. Too many bodybuilders get in a complacent pattern of just doing, for example, standing, free-weight barbell curls. The biceps like any other muscle adapts to training stimulus. In order to continue to promote increases in size it needs to be subjected to a variety of exercise stimuli so you need to ensure that you periodically switch movements around. There is a large variety of curls to employ including machine and cable curls which can occasionally be incorporated Into your program. The use of handle attachments or rope can add a different variation and works the forearms and grip more effectively also. Additionally I would strongly advocate incorporating a compound movement like weighted chins. This will enable you to subject the biceps to additional load whilst eliciting more systemic overall physical development.